GUESS has collaborated with Alibaba Group to bring artificial intelligence to the fashion world. The FashionAI concept store, embodying the technology and showcasing a new model for the digitisation of fashion retail, is open to the public on the Hong Kong Polytechnic University campus, from today to 7 July. Garments and accessories featured in the concept store are provided by GUESS, a strategic partner of Alibaba on the FashionAI project. 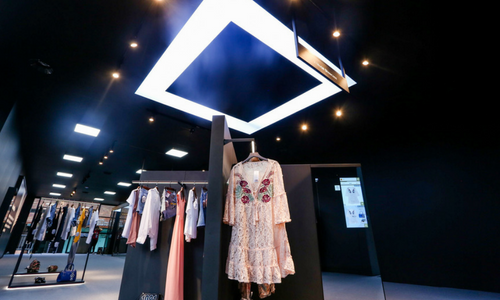 Alibaba’s FashionAI system underpins the concept stores, featuring smart racks and smart mirrors. Garments and accessories touched or picked up by consumers will be automatically displayed on the RFID-enabled magic mirror nearby. Then the smart mirror offers customers personalized mix-and-match clothing and accessory recommendations for customers from the GUESS line, as well as items sold by others on Tmall and Taobao, China’s biggest B2C and C2C platforms, respectively. 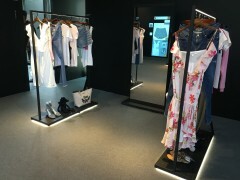 The store also offers a new fitting experience, where after consumers select any items on the smart mirror that they want to try out, the retail staff will be alerted by the in-store system and then prepare garments and accessories in the fitting area for consumers. “With the latest AI technologies, like machine learning and computing vision, FashionAI can now recommend items that match your personal style. That gives imagination to consumers and injects new ideas into fashion brands and retailers to rethink their business and sales models. Leveraging AI in fashion, therefore, offers many untapped opportunities for fashion retailers.” Zhuoran Zhuang, Vice President, Alibaba Group, said. Zhuang added, while retailers can only collect purchasing record in the past, FashionAI allows the brand to overlook the full picture of the customer journey. For instance, the frequency of being pick up for each particular piece of garment or accessory can be recorded. Meanwhile, the purchase record in the offline store will be automatically reflected on consumers’ mobile Taobao or Tmall accounts, so consumers can find even more mix-and-match recommendations from other brands in Taobao and Tmall, expanding the recommendation capability beyond the limits of an offline store. “GUESS and Alibaba share the same vision to understand customer behaviours through technologies. With GUESS’ retail expertise, we are able to train and refine our FashionAI system, and marry technology with fashion in a way that’s never been done before. We are looking forward to deepening our partnership to innovate personalized services offered in retail shops.” Zhuang said. Blanco said GUESS is ready to launch FashionAI in GUESS physical store as soon as Alibaba grants green light, expecting within this year. A new GUESS store will be open in Nathan road soon, “It probably will be the first store to apply the AI technology,” Blanco said. GUESS launched its store on Tmall at the end of 2013 and the brand has been one of the most popular brands in the fashion apparel category. GUESS’ store has achieved more than 100% growth over the last 3 consecutive years. GUESS collaborates with Alibaba closely in the New Retail concept since 2016 with the implementation of the O2O project in both online and offline stores. This free service includes access to over 2,200 titles of movie and drama box sets, among others. ..